Produced in wartime, it might have been a modest volume of small dimensions printed on cheap paper, but it was successfull from the very start. 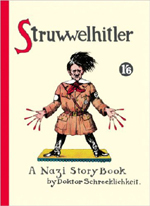 The Struwwelhitler was published in 1941 to raise funds for the Daily Sketch War Relief Fund, which supported the British troops and victims of the German air raids. The book was reprinted several times over a short period. Dr.Schrecklichkeit was the pen name of Robert and Philip Spence, who studied art in Newcastle. Later Robert Spence joined the Royal Society of Etchers and Engravers and Philip became a popular watercolor artist and illustrator. The Struwwelhitler was a collaborative effort; although Robert lived in London and Philip in Gateshead, they created it together working in their respective homes and sending their sketches and ideas back and forth. The work of political satire was published in the same publishing house as the "Daily Sketch", an illustrated newspaper.